The swine flu, also called the H1N1 Flu, is a strain of influenza that has spread through the population of several countries including the United States in 2009. It is spread through human-to-human contact through coughing, sneezing, direct and even indirect touching. Symptoms are typical of the flu: body aches and chills, cough, fever, sore throat and vomiting to name a few. Frequent hand washing is one way to help prevent the spread of the swine flu. In situations where you want to clean your hands but soap and water are not available, use an alcohol-based hand sanitizer. They can be used when the hands are not visibly dirty but you want to make sure they are clean. If you need to sneeze, try to do so into a tissue. Dispose of it into a waste receptacle promptly. Wash your hands as soon as you can. If a tissue isn't available, cough or sneeze into your elbow or the sleeve of your clothing instead of covering your nose and mouth with your hands. You should still wash your hands as soon as you can after coughing or sneezing. If you cough or sneeze, you can spread the virus to anyone within six feet where you are sitting or standing. People who are not feeling well should stay at home until their fever has subsided for at least 24 hours without using a medication to bring it down to a normal level. A person who has symptoms of the swine flu is contagious for several days after they develop symptoms. With the exception of going to see a doctor, the patient should stay at home or travel until they recover. 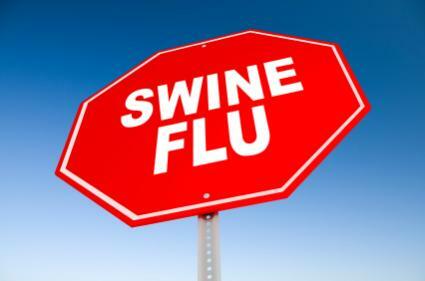 Most people who develop swine flu will need to stay home from work or school for between three and five days. When the H1N1 Flu shot becomes available in your area, talk to your doctor about whether you or your family should receive one. People who have the swine flu can spread the virus for up to eight days after they develop symptoms. However, normally healthy individuals who contract this disease and get it treated early on, can be feeling better within a matter of a few days. In some cases, though, the flu has been known to last for a few weeks. Swine flu can cause serious complications and some patients who contract the virus have died. Most people who get swine flu have a relatively mild illness and recover without having to be hospitalized. Taking swine flu precautions can help to prevent the virus from spreading, so make them a part of your regular routine. The Centers for Disease Control and Prevention have a complete overview of the flu.